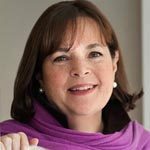 In 1978, Ina Garten left her job as a budget analyst in the White House to pursue her dream of running a specialty food store in the Hamptons. She’s now the author of eight best-selling cookbooks, including her most recent title, Barefoot Contessa Foolproof. She’s also a frequent contributor to many national magazines and has a Food Network television series on entertaining. She and her husband, Jeffrey, split their time between East Hampton, NY, and Southport, CT.
Creamy but not gloppy, light but not abstemious, this shrimp salad is gonna rock your world. And your cocktail party. And your lunch work rotation. Stale bread? Itsoaks up a tangy vinaigrette in this interpretation of an Italian classic from the Barefoot Contessa herself. You’re welcome. Shallots take on a dulcet, docile personality when slowly coaxed to a caramelized brown. Not only easy to make, they’re easygoing in terms of playing nicely with main courses. Know how sometimes you taste something and can’t help but sigh with content? This cake does that to us each and every darn time. A sophisticated cocktail that’s made drinkers swoon for more than a century thanks to the subtle intensity of Cognac, the sweetly tart lilt of lemon, and the effusive effervescence of Champagne. Lots of fresh lemon juice and lemon zest are added to the ethereally light and super smooth dessert mousse to give it a zip of flavor.